With a one-year-old girl who’s just learnt to walk, directing a show at the Sydney Opera House, my footy team making the finals, life is busy and going along nicely. This year I’ve worked as an actor, writer and director. I kicked off the year directing Coranderrk: We Will Show The Country, an inspiring true story of courage and determination (Melbourne Indigenous Arts Festival/Sydney Opera House). I also toured a show I co-created called Bindjareb Pinjarra, a comedy about a massacre! What? Built through improvisation and with proper consultation and respect for protocol, this show is the most flexible and dynamic theatrical experiment I’ve ever been involved with (www.realtimearts.net/article/issue96/9846). I’m currently working on a professional development initiative with Ilbijerri. The idea is to form an all blak ensemble to create stories using a collaborative and eclectic approach. Next year I am involved in the Malthouse production of The Shadow King and Belvoir’s Peter Pan as assistant director. 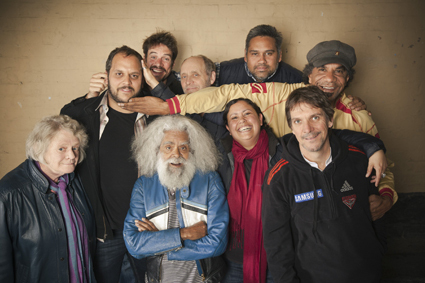 Isaac Drandic is a father, husband, actor, writer, director and is currently the associate director of Australia’s longest running Indigenous theatre company, Ilbijerri. His mother is Noongar from south-west WA and his father is from Croatia.